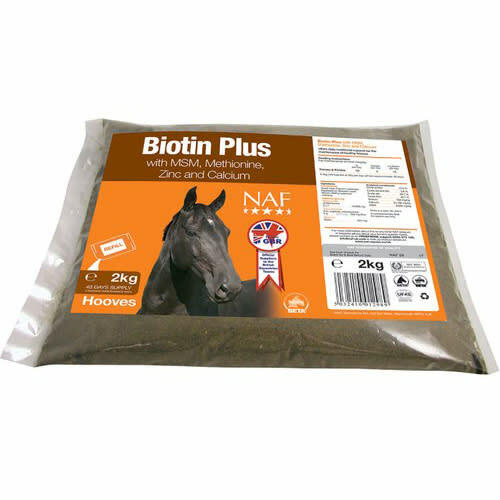 NAF Biotin Plus Horse Hoof Supplement is made up of a variety of elements that strengthen horses hooves. A lack of Biotin has been indicated as one of the causes of weak hooves. This supplement contains methionine, MSM, zinc and calcium. Feeding 15mg daily has been feed to be beneficial for horn growth and strength. Horses and Ponies: Feed 50g/day or 4 scoops/day. 1.5kg pot fed daily at 50g/day will last approximately 30 days.